April 25, 2012, 11:43 a.m. The Paris-based startup already has deals with lots of international newspapers to translate their stories into English. Now they’re starting to find those translations a (hopefully profitable) home. By Adrienne LaFrance @adriennelaf April 25, 2012, 11:43 a.m.
As the translation-based news service Worldcrunch approaches the one-year anniversary of its launch, it’s also tweaking its business approach in three key ways that co-founders Jeff Israely and Irène Toporkoff hope will help it thrive. Worldcrunch’s central goal is to find news that wouldn’t otherwise appear in English-speaking news sources at a time when U.S. news organizations have slashed their budgets for international coverage. You may recognize Israely, a former Time correspondent, from his regular column for Nieman Lab about the process of launching a news startup. A year in, he’s getting a better sense of what it takes to keep one going. First, Worldcrunch has plans to increase its output. The most straightforward way to do this, as many news organizations have found, is to aggregate from other sources. But Worldcrunch will do so with a twist: Call it translaggregating — translating what you aggregate. “That’s going to allow us to really be more dynamic, more reactive, and expand the kind of stories we can produce, and how we can produce them, and when we can produce them,” Israely told me from Paris, where Worldcrunch is based. One way the site aims to bump up the volume of aggregated material is through a crowdsourced initiative it’s calling “Crunch It.” Worldcrunch will call on volunteers to nominate articles for translation, “English-ize” them, and vote for the best finished pieces. But Israely said the Worldcrunch team is still figuring out exactly how process will work. He calls the initative “in the neighborhood of crowdsourcing,” but he also wants to put certain quality safeguards in place. Making sure a story is right for Worldcrunch isn’t simply about impeccable multilingual skills — it has to be a story that doesn’t already appear in English. But even as the paywall goes up, Worldcrunch is shifting away from the idea that its website will be the sole hub for its readers. Arguably the most important development to the Worldcrunch business model is that it’s forging partnerships with English-language publications that will pay for translated content. Worldcrunch is already selling content to the Toronto Star, and is in talks with a U.S. publication about a similar deal. Here’s how it works: A non-English news organization gives Worldcrunch permission to translate its content. Worldcrunch then posts the translated content to its website, and offers to sell it to English-language news organizations. Those organizations pay Worldcrunch an undisclosed amount, and Worldcrunch gives the original content producer a 40 percent cut. Israely and Toporkoff see this distribution model as a win-win-win: The original publication gets a much wider audience for its stories (plus some extra revenue); English-language publications provide valuable international news to their readers; Worldcrunch can pay its bills and keep the cycle going. With the slogan “all news is global,” the site operates with three editors and about a dozen freelance translators. Working with media partners across Europe, Asia, Africa, and Latin America, Worldcrunch translates about 30 articles per week into English from German, Turkish, French, Italian, Russian, Portuguese, Chinese, Arabic, and Spanish. Worldcrunch aims to do what even the old network of foreign bureaus had trouble doing: providing original, domestically produced coverage for an international audience. Earlier this month, German-language newspaper Die Welt published a column about a controversial poem penned by Nobel Prize winner and former Nazi Günter Grass (the poem was published in another German newspaper, Süddeutsche Zeitung), and Worldcrunch translated it. While you could have read about the scandal in The New York Times, that story — published three days after the Worldcrunch piece — didn’t provide the same direct cultural perspective (the Times coverage has a joint byline from Israel- and Berlin-based correspondents). The Times reports that Grass’ views “are relatively common among European intellectuals,” though “strung together” in a way that incited outrage. But Henryk Broder’s column for Die Welt actually articulates those views in the context of the Grass imbroglio. Then there is the “meta-example” that Israely gives of an article — from China’s Economic Observer — highlighting the global scarcity of press freedom. Along those same lines, working with a (relatively) independent newspaper out of China can be unpredictable. Though there are certain boundaries he says The Economic Observer won’t cross (they won’t write about Chinese artist and dissident Ai Weiwei, for instance), he has been surprised by how provocative, lively, and sometimes irreverent the paper can be. Israely says that establishing partnerships in the first place is the hardest part. His job is to convince them of a principle that he says was best summed up in a recent TechCrunch article: Whoever creates the best content at the lowest cost possible will create the most value over time. 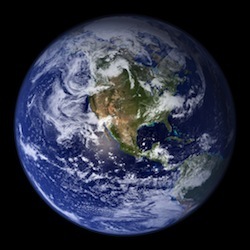 Photo of Earth by NASA Goddard Space Flight Center used under a Creative Commons license. POSTED April 25, 2012, 11:43 a.m.
LaFrance, Adrienne. "Worldcrunch wants to be the Internet’s Rosetta Stone for news." Nieman Journalism Lab. Nieman Foundation for Journalism at Harvard, 25 Apr. 2012. Web. 18 Apr. 2019. LaFrance, Adrienne. "Worldcrunch wants to be the Internet’s Rosetta Stone for news." Nieman Journalism Lab. Last modified April 25, 2012. Accessed April 18, 2019. https://www.niemanlab.org/2012/04/worldcrunch-wants-to-be-the-internets-rosetta-stone-for-news/.